Around just about any corner in London you’ll find layers upon layers of history to discover. 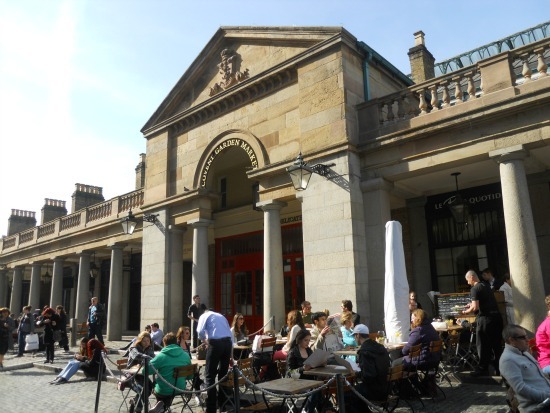 Just take Covent Garden, which today is one of London’s liveliest areas with outdoor cafes, stylish shopping and entertainment – from the Royal Opera House and all the theatres to the energy and fun of street performers and buskers. As ruins from Roman Londinium are being uncovered nearby in the City, the area that is now Covent Garden was also home to a Roman settlement in the 1st century AD. The name Covent Garden comes from the Middle Ages when about 40 acres of what is now the busy West End of London looked quite different. Think vegetables … and a lot of them! This are was the large garden for the Abbey of St. Peter at Westminser. That is, it was the Convent Garden, which over time became Covent Garden. The Abbey’s gardens were an important source of fruit and vegetables in London, and the area has been associated with markets ever since. The idea of Covent Garden as a flower and fruit and vegetable market was immortalized in the 1964 film My Fair Lady, which depicted the poor flower girl Eliza Doolittle in Covent Garden. While it wasn’t filmed in London (although the stage version premiered at Covent Garden’s Theatre Royal Drury Lane in 1958! ), this clip from the movie is the perfect prelude to a historical and present day romp through Covent Garden. And it’s just so perfect because Covent Garden sits at the heart of London’s Theatre District, with the Royal Opera House, Theatre Royal Drury Lane, Adelphi Theatre, Wyndham’s Theatre and so many more important theatres located nearby. You might be wondering just how this Medieval vegetable garden became so elegant and home to the theatres and beautiful buildings you see today. Even though you likely wouldn’t suspect it, we’ll have to ask Henry VIII. In 1540, King Henry VIII dissolved all of the England’s monastic properties and handed over a large chunk of Westminster’s veggie patch to John Russell, the 1st Earl of Bedford. Not a bad transaction since the property stayed in the same family until 1918! Covent Garden circa 1720 in an engraving by Sutton Nicholls. St. Paul’s Church is on the left. All was well and good with the vegetable growing until the fourth Earl of Bedford decided to do a bit a building. In 1630, he commissioned the very fashionable architect Inigo Jones to build houses on the land that would be appropriate for gentlemen of the finer class. Thus elegance enters the history of Covent Garden for the first time. Inigo Jones had travelled through much of Europe and was inspired especially by the large piazzas in Italy. Curious to bring this grand Italian design to London, Jones built the first open square in England. It was, quite naturally, a smash hit! The central area of Covent Garden is still referred to as the “Piazza,” so now you know just how it got its Italian name. Thanks, Inigo! 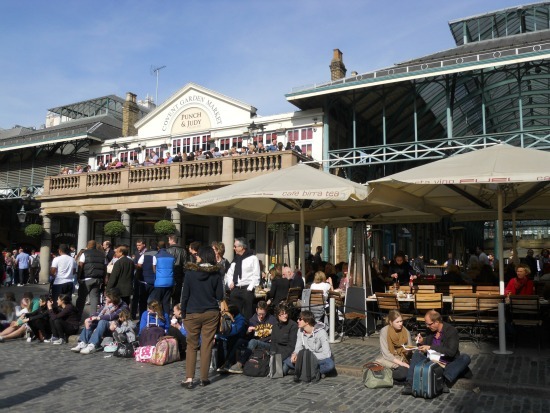 Despite the elegant homes, Covent Garden has always been known for two things – the markets and entertainment. 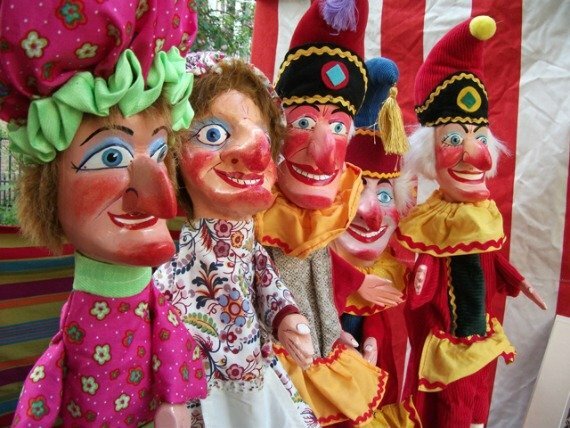 As early as 1642, the great London chronicler Samuel Pepys described the first Punch and Judy shows in Covent Garden, which were popular through the 18th and 19th centuries. 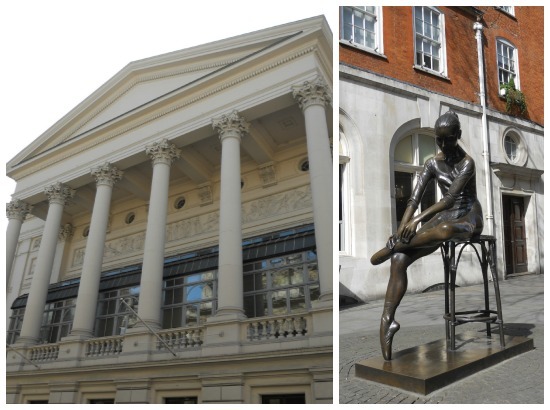 In 1663 the Theatre Royal on Drury Lane was founded, and it is impressively the oldest functioning theatre in London. The rest is theatre history as more and more important theatres opened and the area became the home of the many actors and performers. St. Paul’s Church has watched over all the comings and goings in Covent Garden’s Piazza. Designed by Inigo Jones and built in 1632-2, it is known as the actors’ church, and inside you’ll find numerous memorials to actors and writers. Step inside and the church offers a peaceful moment away from the energy and excitement of Covent Garden. The gardens behind the church are a popular spot to rest and enjoy a bit of natural beauty. 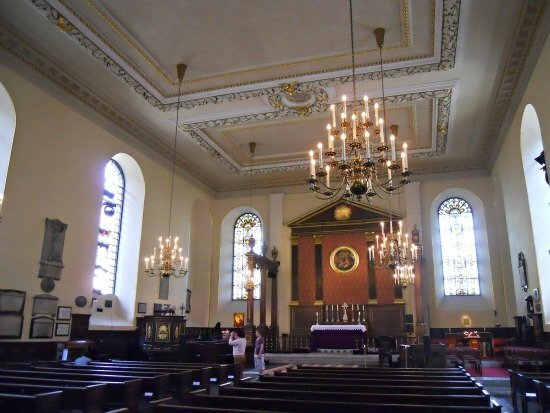 The peaceful interior of St. Paul’s Church in Covent Garden – designed by Inigio Jones in the 17th century! The open space was perfect for performing, but also for … yep, you guessed it … holding fruit and vegetable markets! After the Great Fire in 1666, which destroyed many of the markets in the east end of the city, Covent Garden once again became one of the most important sources for fruit and vegetables in London. The central area of the Piazza was eventually tidied up and covered with an iron and glass structure, which was designed by Charles Fowler in the 1830s. Additional markets were established in the area surrounding the Piazza, which served as a market area until 1974 when the market moved east. In the 80s Covent Garden was transformed into the shopping, dining and entertainment area that we love today. 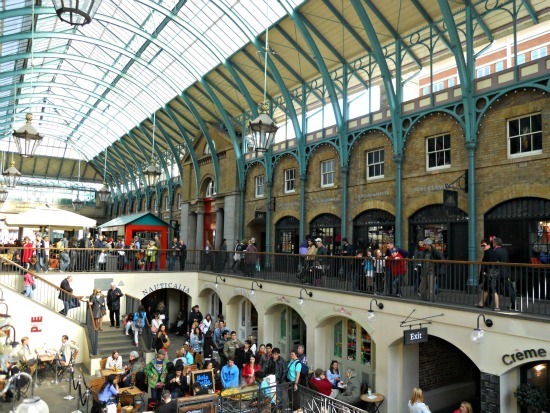 Covent Garden is still synonymous with entertainment and markets, which is the fun of this part of London. Take a stroll around the Piazza today and you’ll find street performers, musicians and artists all ready to entertain. Soak up the sun at an open-air cafe or hit the markets to do some shopping. The Apple Market is dedicated to handmade arts and crafts and it’s located right in the center of the covered area of Covent Garden. Along each side you’ll find wonderful shops to explore, from clothing to gourmet food stores and British specialties. 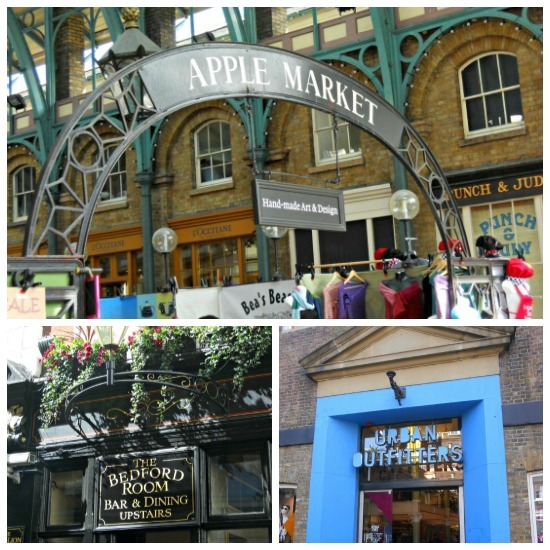 Stroll through the covered market areas of Covent Garden to see all the little shops on the upper and lower levels. If you need a break to rest your feet, there are plenty of little restaurants and cafes in the market – and nearly always entertainment of some kind! The streets around Covent Garden and the Piazza are just as colorful and fun. Many of the names reflect the history of the area, including King Street, Charles Street and Henrietta Street, which were named for King Charles I and Queen Henrietta. Floral Street, Long Acre and Neal Street are particularly fine for shopping. You’ll find classic British pubs interspersed with familiar names. Keep a lookout for the Lamb & Flag pub on tiny Rose Street near Covent Garden, which opened its doors in 1623 and is the oldest pub in the area. Colourful Neal’s Yard is a Covent Garden favourite! 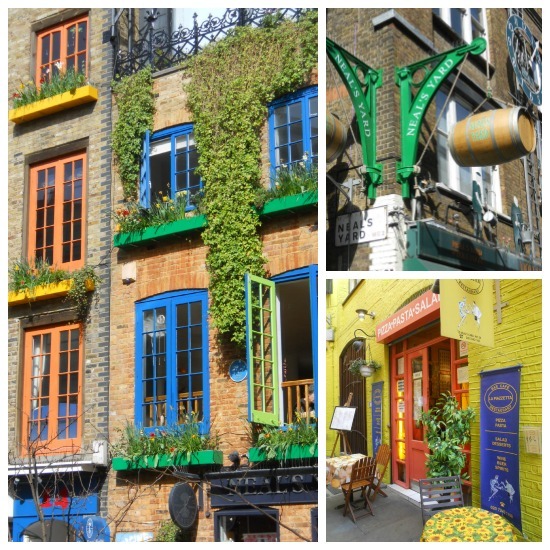 One of our favourite spots int he Covent Garden neighbourhood is the riot of colour in Neal’s Yard. This little spot is tucked away near Seven Dials, but it’s well worth seeking it out for the brightly painted buildings and the cute shops and restaurants. If you like natural products, stop in Neal’s Yard Remedies for lovely organic skin care products, aromatherapy and natural health care products. Walking along the shopping streets is fun even if you’re not a big shopper. There’s just such a vibrant energy to the Covent Garden area. 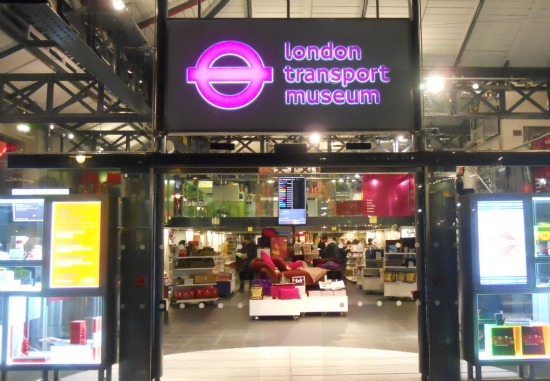 If you love the classic double decker buses and riding the Tube in London, stop in the London Transport Museum just off the Piazza. They have a wonderful gift shop that we pop in every time we’re strolling through the neighbourhood. 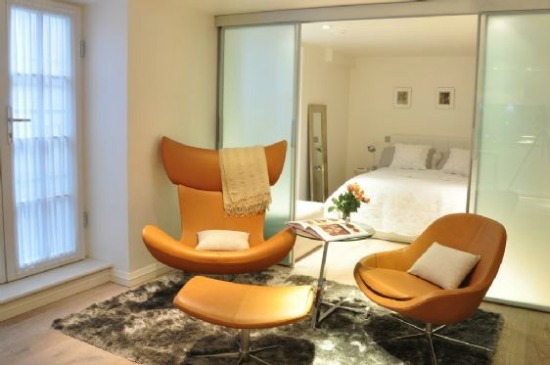 If you would like to stay near all the excitement and fun of London’s West End and Covent Garnden and yet enjoy a tranquil apartment setting, our Eden studio rental near Trafalgar Square is a great choice! 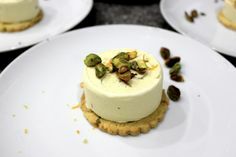 It’s set on a quiet street between the Thames and the Strand just a short stroll from Covent Garden. Catch a theatre show in the evenings, stop by a local pub for a pint and enjoy the atmosphere of Covent Garden all just a few minutes walking from the Eden! Enjoy a visual stroll through Covent Garden in this fun video that captures some of the most iconic spots and experiences of this lively neighbourhood. Find out more about what to see and do in Covent Garden by visiting our Covent Garden neighbourhood guide. We hope you’ll enjoy discovering this vibrant and fun area on your next trip to London! 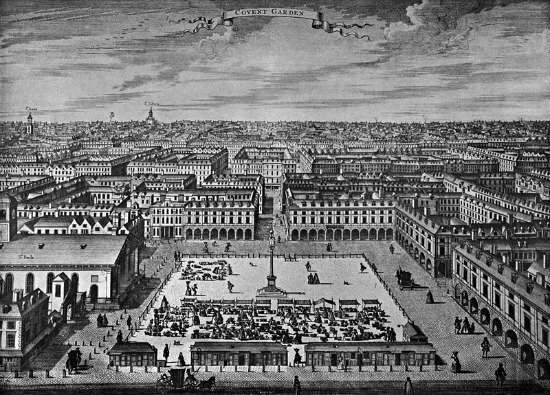 Image credits: All photos by author, Covent Garden engraving from 1720, Covent Garden video by Another Flow of Time. 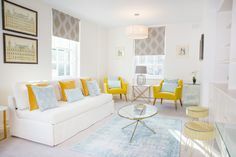 PREVIOUS: London Perfect is on Pinterest! 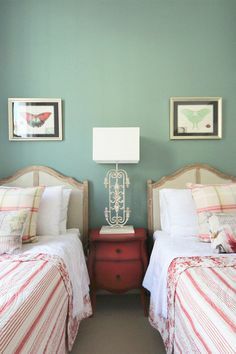 Posted on Friday, April 12th, 2013 at 10:59 am in See & Do. You can follow any responses to this entry through the RSS 2.0 feed. You can leave a response, or trackback from your own site.